i’m trading in my resolutions. | sara, darling. i’m trading in my resolutions. So, a few weeks ago I wrote about my thoughts on 2011 and promised I would be back with a way to plan ahead, to get more done, no–scratch that, to BE more in the next year. Awful good plan that actually might be…if I was someone else. And I’m seldom ready for Audacious New Goals the very first week of the year. Or ever, really. Goals, as I’ve written about before, have always been yet another opportunity for me to disappoint myself. I’ve been in awe of people who accomplish amazing things, but I never counted myself among them. On the flipside, though, I want to have direction in life. Without goals, how do you get things done? Aren’t goals good? Like, maybe if you made real goals, or goals that have all the requisite acronym-y details like being measurable, attainable, etc.? I’m sure they are. But you want to know what one of the hardest things for me to do is? Decide what I actually want — and how to get there. Determining what is attainable to me, what would be useful or beneficial (which my mind sadly twists around to mean “perfect”, like it has positivity-specific dyslexia) just ties me all up. It binds my hands, slows my feet, makes me inert. Paralyzed to do anything but maintain the status quo-hum. Something about unmoveable goals that MUST be set at in January, before I’ve even gotten two steps in the door of 2012 and hung my coat on its hook, waiting around for 51 weeks to pop up again, unfinished and guilt-laden—just isn’t working for me this year. This Christmas gift by my dear love which now hangs in my home office reminds me that little things matter. That I matter, even when I feel small. That the choices I make every day mean something. That consistent actions will lead to unimagined, remarkable things. 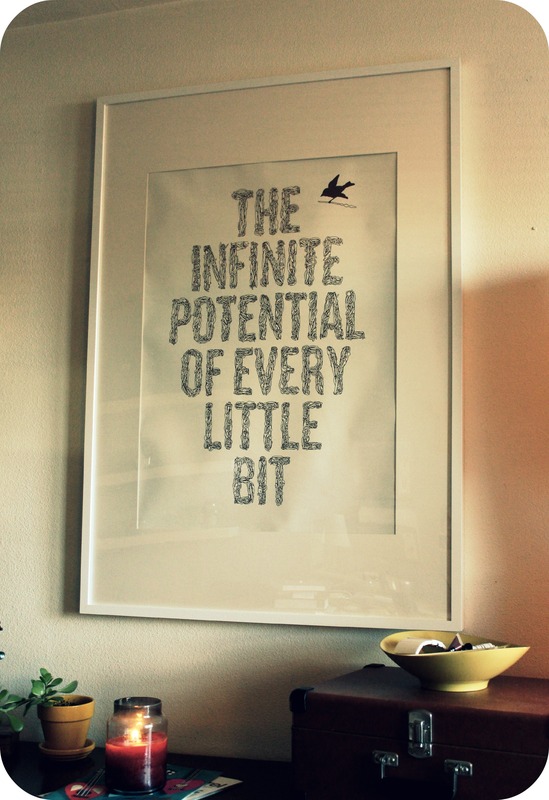 That every little bit has an infinite potential. ← January Photo A Day Roundabundlewrap. adopting this as my mantra as well. because, you know, i already own it, kind of.